Finite-differences methods such as the Lax-Wendroff method (LW) are commonly used to solve 1D models of blood flow. These models solve for blood flow and lumen area and are useful in disease research, such as hypertension and atherosclerosis, where flow and pressure are good indicators for the presence of disease. Despite the popularity of the LW method to solve the blood flow equations, no implementation of a LW solver for these equations has been published and made publicly available. This leads to the reimplementation of the same methods within different research groups and makes verification of results more difficult. The Vascular Modelling in Python (VaMpy) toolkit is a Python package that aims to fill this gap. It implements Richtmyer’s two-step Lax-Wendroff scheme to solve 1D model equations of blood flow in arterial trees and aims at facilitating the solution of blood flow problems for various medical applications. Funding statement: The development of this software was supported by an EPSRC Doctoral Training Centre grant (EP/G03690X/1). One-dimensional (1D) modelling of the cardiovascular system is useful in predicting and understanding the dynamics of blood pressure propagation [1, 2, 3, 4, 5, 6]. Here, arteries are regarded as 1D axisymmetric tubes that are described by flux q inside the lumen and cross-sectional area A of the vessel lumen along the vessel length. One popular finite-differences method to numerically solve the equations governing blood flow through arteries is Richtmyer’s two-step Lax-Wendroff method [7, 8], which has been used by a number of groups [1, 4, 6, 9, 10, 11]. Alternative methods of solving the blood flow equations include for example variations of the Galerkin finite-element method, which instead solve the blood flow equations for flow velocity u and cross-sectional area A [2, 12]. The computational implementation of the Lax-Wendroff method is straightforward and previously mentioned references have produced results that are validated against experimental results, justifying the popularity of the method. However, no openly available implementation of the Lax-Wendroff method could be found, which results in the same work being carried out numerous times. Whilst one open-source Python package implementing a haemodynamic model exists, pyNS focusses on the implementation of a 0D pulse wave propagation model, representing arteries as electrical circuits , and therefore its scope and application are different from VaMpy. Solutions computed using VaMpy are exported to the commonly used CSV file format, thereby allowing for the integration of data with most other software. For example, solutions calculated using VaMpy could be used as a boundary condition for higher order models of larger arteries further upstream. can be derived. Details on the derivation of (4) can be found elsewhere [1, 6]. Here, the unknowns are the vessel cross-sectional area A(z, t) and flux q(z, t). Elasticity of the vessel is described by the quantity f(r0) with relaxed vessel radius r0(z), A0(z) is the relaxed cross-sectional vessel area, R(z, t) the vessel radius, δb is the boundary layer thickness and Re is the Reynold’s number. Although these equations have been commonly used by various groups [1, 4, 5, 14], no publicly accessible implementation of the solution to (4) could be found, meaning that each publication from a separate group resulted in the reimplementation of the same or very similar methods and equations. Therefore, the Vascular Modelling in Python toolkit (VaMpy) was developed and published on GitHub1 with the documentation available on GitHub Pages.2 Support for the use of VaMpy is mainly available via the Issue Tracker feature on GitHub, but also via contacting the authors. The VaMpy implementation and architecture are described in this section. VaMpy is object-oriented to allow for an intuitive understanding of its design and to facilitate the addition of new features. The base of the package is the class ArteryNetwork, which defines the arterial tree. The class contains methods that are applied on the entire network of arteries as well as boundary conditions. Each artery within the tree is defined as an object of the class Artery, which contains its own solver instance. The solver itself is implemented in the independent class LaxWendroff that implements the Lax-Wendroff method as described below. This approach allows for the integration of other solvers within the software. is shown in Figure 2. It illustrates that both initial conditions at n = 0 for all m and left and right boundary conditions are required to determine U. Illustration of the LW method. The solution is fully known at time step n (black circles) and we are looking for the solution at grid point m at time step n + 1 (white circle). To determine the unknown solution, two intermediate solutions at half grid points m ± 1/2 and at half time step n + 1/2 are determined from grid points m – 1, m and m + 1 at current time step n. The intermediate solutions are then used in conjunction with the known solution at grid point m and current time step n to calculate the unknown solution at grid point m and next time step n + 1 .
is evaluated from (6), see also [1, 4]. is found via the state equation (11). The algorithm stops after kmax iterations or when the difference between pressure estimates is less than the small threshold value ϵ.
where k indicates the current iteration, = (x1, x2, …, x18), J (xk)) is the Jacobian of the system of equations and fJ (xk) is the vector of residuals. The full system of equations required to solve the boundary conditions at bifurcations can be found elsewhere [6, 15]. Algorithm 2: Setup routine for a network of arteries. The artery network is created as a binary tree and contains 2depth – 1 arteries. 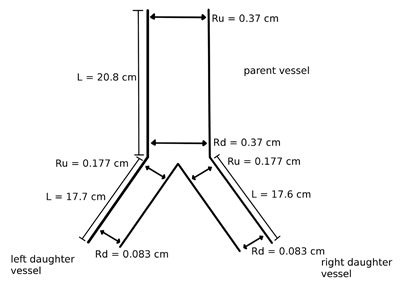 At each depth level the up- and downstream radii of daughter vessels are calculated using the scaling parameters a and b. Artery objects are then created for each new daughter vessel and stored in a list. Here, Ru, Rd and lam are iterables (for example lists or Numpy arrays) of length depth containing these values for each artery. The remaining parameters required by the ArteryNetwork constructor are the elasticity parameter k, blood density rho, blood viscosity nu, diastolic pressure p0, number of output parameters ntr and Reynold’s number Re. The latter method is used by the examples shown in this paper. The spatial discretisation is created by supplying the spatial step size dx, which is used internally to create Numpy arrays for all variables along the vessel. Timing parameters are the time step size dt, time of one period T and, optionally, the number of periods tc, which defaults to one if left unspecified. Initial conditions are supplied for q(z, t) as a single value q0, while the initial condition for A(z, t) is calculated from the radii at rest. The solve function is supplied with boundary condition parameters q_in and out_args, where q_in contains the values q(0, t) and out_args contains the parameters for a 3WK model. is the wave speed. The CFL condition is automatically checked by the ArteryNetwork solver and the simulation stops with an error message if the condition is not met. The VaMpy Git repository contains unit tests to ensure functions perform as expected. Additionally, the file bifurcation_example.py demonstrates VaMpy’s performance by validating its results against results in  on the common carotid artery bifurcation. Whilst unit tests demonstrate that the functionality of the software meets expecations, validation against experimental results and other researchers’ results ensures that the software additionally generates sensible output data and that parameters have been chosen sensibly. Users implementing arteries using other parameters than the ones tested in the example files in VaMpy should therefore always cross-check their results against experimental or other simulation results using the same parameters to ensure that the choice of parameters is realistic. The solution computed using VaMpy is shown in Figure 3 and matches the corresponding figures in . Thus this example demonstrates that VaMpy performs as expected. One pulse in the common carotid artery using VaMpy: a) flow rate, b) pressure. Comparison with the results for the same simulation in  validates the implementation of the blood flow equations in VaMpy. The first version of VaMpy focusses on the simulation of a single bifurcation, i. e. one parent vessel with two daughter vessels. The development of the first version of VaMpy was based on the simulation of flow through the middle cerebral artery in order to evaluate lymphatic drainage through the wall of the artery , and for this purpose a single bifurcation was regarded sufficient. Validation on larger networks of arteries with multiple levels of bifurcations has therefore not been carried out yet, but is planned for the next release cycle. Additionally, it is planned to offer a choice of alternative outlet boundary conditions, such as the structured tree [1, 5]. It has been demonstrated that by taking into account bifurcation pressure drops, the accuracy of reduced order models such as the system of equations (4) can improve significantly compared to higher order models . This means that a similar accuracy of blood flow solutions could be achieved for 1D models compared to 2D or 3D models by increasing the depth of the arterial tree to be modelled. VaMpy is compatible with any operating system that is compatible with Python 2.7 and the dependent packages. VaMpy was written in and for Python 2.7 and above. There are no additional system requirements. However, the requirements for memory and processing power are dependent on the number of the grid points. Modelling blood flow dynamics is a useful tool in vascular diseases research and 1D models provide good approximations. The method implemented in VaMpy is used by a variety of research groups [1, 4, 11] and therefore it is expected that the reuse potential for VaMpy is high, especially in multiscale simulations. Because the commonly accepted CSV file format is used for input and output data for VaMpy integration of results from VaMpy simulations with other third-party software packages is expected to be straightforward. For example, VaMpy could be used as a boundary condition for 3D simulations or constitute a part of multi-scale simulations. integration of models of the dynamics of the artery wall. The current release of VaMpy was developed to implement a bifurcation at the middle cerebral artery as part of a multi-scale model of lymphatic flow through the basement membrane embedded in the artery wall, which is relevant for resolving the mechanisms behind the onset and progression of Alzheimer’s disease [6, 17]. The authors thank Maximilian Albert for advice and guidance on the use of GitHub repositories and Python code repository conventions. Olufsen, M S et al. (2000). “Numerical Simulation and Experimental Validation of Blood Flow in Arteries with Structured-Tree Outflow Condition”. Annals of Biomedical Engineering 28(11): 1281–1299, DOI: https://doi.org/10.1114/1.1326031 URL: http://link.springer.com/article/10.1114/1.1326031. Sherwin, S J et al. (2003). “Computational modelling of 1D blood flow with variable mechanical properties and its application to the simulation of wave propagation in the human arterial system”. International Journal for Numerical Methods In Fluids 43(6–7): 673–700, DOI: https://doi.org/10.1002/fld.543 URL: http://onlinelibrary.wiley.com/doi/10.1002/fld.543/abstract. Kolachalama, V et al. (2007). “Predictive Haemodynamics in a One-Dimensional Carotid Artery Bifurcation. Part I Application to Stent Design”. IEEE Transactions on Biomedical Engineering 54(5): 802–812, DOI: https://doi.org/10.1109/TBME.2006.889188 URL: http://ieeexplore.ieee.org/document/4155000/. Cousins, W and Gremaud, P A (2014). “Impedance boundary conditions for general transient hemodynamics”. International Journal for Numerical Methods in Biomedical Engineering 30(11): 1249–1313, DOI: https://doi.org/10.1002/cnm.2658 URL: http://onlinelibrary.wiley.com/doi/10.1002/cnm.2658/abstract. Diem, A K (2016). “Prediction of Perivascular Drainage of Ab from the Brain Using Computational Modelling: Implications for Alzheimer’s Disease”. PhD thesis. University of Southampton. Richtmyer, R D (1963). “A Survey of Difference Methods for Non-Steady Fluid Dynamics”. NCAR Technical Notes 63(2)DOI: https://doi.org/10.5065/D67P8WCQ URL: http://opensky.ucar.edu/islandora/object/technotes:49. Smith, N P, Pullan, A J and Hunter, P J (2002). “An Anatomically Based Model of Transient Coronary Blood Flow in the Heart”. SIAM Journal on Applied Mathematics 62(3): 990–1018, 0036-1399DOI: https://doi.org/10.1137/S0036139999355199 URL: http://epubs.siam.org/doi/abs/10.1137/S0036139999355199. Itu, L M and Suciu, C (2011). 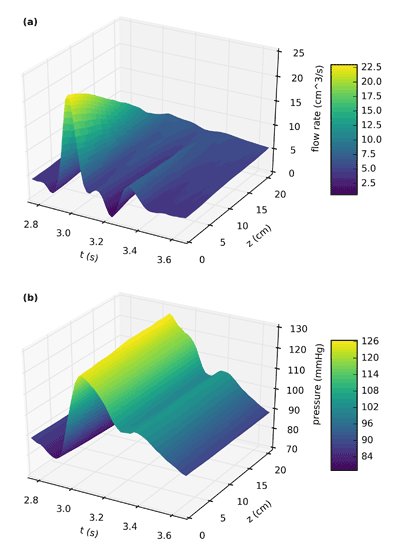 “Analysis of outflow boundary condition implementations for 1D blood flow models”. Proceedings of the 3rd International Conference on E-Health and Bioengineering. 4: 24–27. URL: http://ieeexplore.ieee.org/xpls/abs_all.jsp?arnumber=6150403. Mynard, J P and Nithiarasu, P (2008). “A 1D arterial blood flow model incorporating ventricular pressure, aortic valve and regional coronary flow using the locally conservative Galerkin (LCG) method”. Communications in Numerical Methods in Engineering 24: 367–417, 20407939DOI: https://doi.org/10.1002/cnm.1117 URL: http://onlinelibrary.wiley.com/doi/10.1002/cnm.1117/full. Manini, S et al. (2015). “pyNS: An Open-Source Framework for 0D Haemodynamic Modelling”. Annals of Biomedical Engineering 43(6): 1461–1473, 15739686DOI: https://doi.org/10.1007/s10439-014-1234-y URL: https://link.springer.com/article/10.1007/s10439-014-1234-y. Devault, K et al. (2008). “Blood Flow in the Circle of Willis Modeling and Calibration”. Multiscale Modeling & Simulation 7(2): 888–909, DOI: https://doi.org/10.1137/07070231X URL: http://epubs.siam.org/doi/abs/10.1137/07070231X. Olufsen, M S (1998). “Modeling of the Arterial System with Reference to an Anesthesia Simulator”. PhD Thesis. Denmark: University of Roskilde. URL: http://rudar.ruc.dk/handle/1800/744. Bakker, E N T P et al. (2016). “Lymphatic Clearance of the Brain Perivascular, Paravascular and Significance for Neurodegenerative Diseases”. Cellular and Molecular Neurobiology 36(2): 181–194, DOI: https://doi.org/10.1007/s10571-015-0273-8 URL: https://link.springer.com/article/10.1007/s10571-015-0273-8.